Fri., Feb. 10, 2017, 4:52 a.m.
WASHINGTON – When he was criticized for his sweeping temporary ban on immigrants from seven Muslim-majority nations, President Donald Trump quickly said that Barack Obama had selected the countries. When he reorganized the National Security Council to add his chief strategist, Trump said Obama had done the same thing. When he authorized a raid in Yemen that left one Navy SEAL dead, Trump said Obama had planned the operation. After eight years of trying to delegitimize the nation’s first black president, Trump has embraced a new strategy: legitimizing his own fledgling presidency by telling everyone he is merely following in Obama’s footsteps. The strategy has made some Republicans cringe and some Democrats even more boastful of the former president who left office last month with approval ratings that would make Trump envious. Scott Jennings, a veteran Republican operative who served as political director for President George W. Bush, said stressing the “continuity of government” was valid because presidents inherited a variety of issues from their predecessors. Ken Mayer, a political science professor at the University of Wisconsin-Madison who wrote “With the Stroke of a Pen: Executive Orders and Presidential Power,” said Trump was making an argument that helped him get through the controversy. “For some people in his base, they don’t care about that,” he said. In many cases, Trump’s allegations about Obama, usually made through White House press secretary Sean Spicer, are exaggerated or incorrect. But more surprising to some is that the usually in-your-face former TV personality is trying to provide an excuse for his behavior when he hasn’t felt the need to in the past. Presidents usually have tense relationships with their predecessors, especially if they are of different parties, though Trump and Obama have a more complicated relationship than most. Long before the presidential race launched, Trump had spent years questioning whether Obama had been born in the United States and was able to serve as president, a charge perceived as racist by many Obama supporters. During the campaign, Trump ran on erasing many of Obama’s top accomplishments, including repealing the Affordable Care Act, pulling out of the Iran nuclear deal and resuming deporting immigrants who are in the U.S. illegally. Obama, in turn, described Trump as a threat to the republic, blasting his temperament and policies. After the election, though, Trump and Obama met in person twice and spoke on the phone several times as they worked on transitioning the government from one administration to another. Trump has been complimentary of Obama and speaks often about how well they get along. Obama, who blamed his predecessor, Bush, for many issues he inherited when he first came into office, departed the White House last month but is staying in Washington, leaving him in the middle of the politics that many presidents try to get away from after their terms have ended. And Trump’s first three weeks in office have been filled with controversies. He faced massive protests after issuing an executive order that froze refugee admissions and temporarily blocked people from seven Muslim-majority countries – Iran, Iraq, Libya, Somalia, Sudan, Syria and Yemen – from entering the United States, even with valid visas. He faced outrage after giving chief strategist Steve Bannon a permanent role on the National Security Council while demoting the director of national intelligence and the chairman of the Joint Chiefs of Staff from their positions as principal members of the council. And most recently a military operation targeting an al-Qaida camp in south-central Yemen – the first such strike under Trump – was criticized as poorly planned and executed. 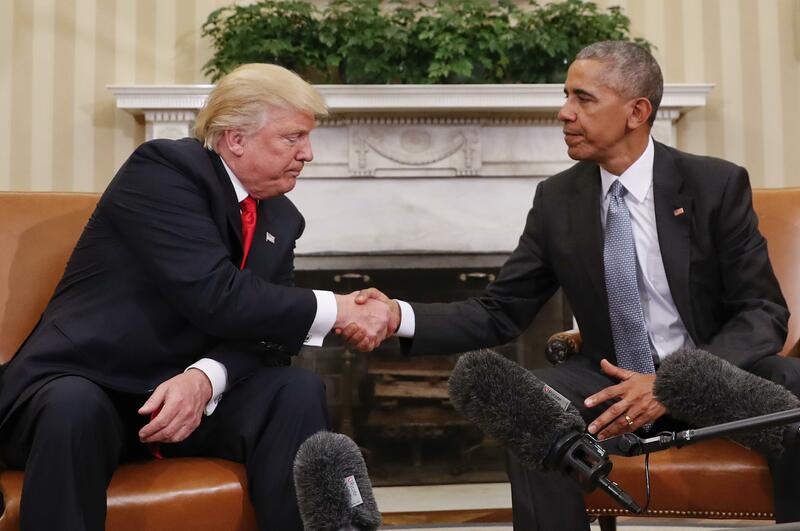 Each decision had one thing in common, according to Trump: Obama. Obama’s office did not respond to a request for comment. But last week his spokesman, Kevin Lewis, disputed any similarities between Trump’s travel ban and Obama’s policies. “With regard to comparisons to President Obama’s foreign policy decisions, as we’ve heard before, the president fundamentally disagrees with the notion of discriminating against individuals because of their faith or religion,” he said. Mo Elleithee, a spokesman for the Democratic National Committee during the Obama years who now leads Georgetown University’s Institute of Politics and Public Service, said Trump was just trying to deflect blame, the same way he did when he criticized Democrats, judges and the news media. Published: Feb. 10, 2017, 4:52 a.m.